All of us at Eucalan have been thrilled at the response to our newest product, Wrapture by Kristin Omdahl. Our new scent captures the romantic and intoxicating scent of night blooming jasmine and was recently featured in USA Today's Full Figured Fashion supplement! Wrapture and the entire family of Eucalan products was endorsed as the perfect complement to care for and extend the life of your lingerie. Click here to read the entire report, which includes great articles from Mo'Nique, Jessica Simpson, Perez Hilton, Rosie Mercado, Jessica Kane, Brittany Gibbons and many more! 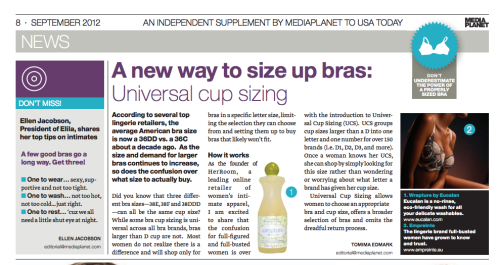 Wrapture is featured on page 8 and contains some great advice from bra expert Ellen Jacobson, president of Elila. For those of you who are excited to give Wrapture a try, we're beginning to ship out orders to shops throughout North America! Our fans in Toronto will be able to purchase Wrapture from Distinctive Sewing Supplies (booth #830), our official supplier at the Fall 2012 Creativ Festival October 12-14! They will also be accepting pre-orders on the 4L/1 gallon jugs in your choice of Eucalyptus, Lavender, Grapefruit and Unscented, so please email them to reserve yours to pick up at the show! Kristin Omdahl knits at CurveNY. For many of our fans, fall means a return to handcrafts – sewing, quilting, needlepoint, knitting and crochet are all great activities for the crisp fall days ahread (and the finished products always benefit from a little Eucalan treatment!). Fall is also a great time to learn something new – whether you're completely new to the world of crafts, or just looking to expand your crafting horizons, we hope to inspire you to step outside of your comfort zone and try something new this season! A great place to start is Craftsy.com, where you can learn a dizzying array of crafting techniques, all from the comfort of your home! We first heard about this website from Kristin Omdahl, whose Sweetheart Shawls online course teaches the ins and outs of knitting lace (watch the trailer here!). There really isn't a better pairing than Kristin's romantic shawl designs featured in the class and Wrapture by Kristin Omdahl, featuring the sensual scent of night-blooming jasmine. Our website and YouTube channel have lots of handy information to help you properly care for your hand-made items with Eucalan; our gentle formula will condition fibres and keep your projects looking like new, season after season. Your local craft supply store is also a great source for both inspiration and instruction. Many cities and towns also have craft-specific guilds which often host events and workshops; a few of the larger associations include the Knitting Guild Association, the American Needlpoint Guild, the Embroiderers' Association of Canada and Quilt Guilds Worldwide. Many people who stopped by the Eucalan booth at CurveNY and CurveNV were interested to find out what Kristin was making. 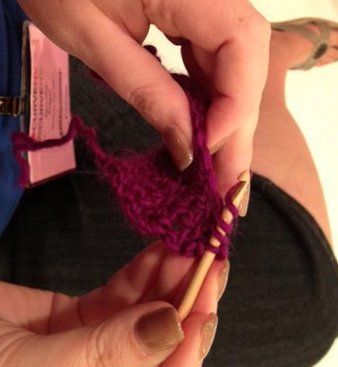 In fact, Kristin even ended up teaching our managing director, Jennifer Edgar, how to crochet while in Las Vegas! Woolens especially benefit from the natural moth-repellent properties of our Lavender and Eucalyptus scents; our Grapefruit and Wrapture scents are naturally antiseptic due to the essential oils each formula contains (Grapefruit and Jasmine, respectively). While hand-knit and -crochet items are typically immersed in a basin of lukewarm water and a teaspoon of Eucalan, needlepoint and embroidery pieces require special care. Watch our video below for an easy how-to using your favourite Eucalan scent!